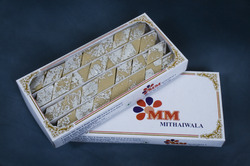 Available with us is a range of visually enticing and mouthwatering Kaju Katli. These Indian sweets are prepared by making use of excellent quality cashews, pure mawa, milk and sugar, which are mixed together accurately. 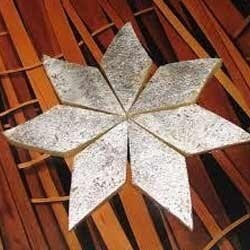 Further, these are offered in several shapes like square and diamond, and are offered with an edible silver coating. Assorted Kaju Sweets. Rates for 0.500 Gms. For India. Kaju Sweet is our delicious collection of Cashew based Indian Mithais made to celebrate every special occasion. Its our small effort to offer Traditional Cashew based Sweets blended with our rich experience of cooking art. Made of mawa (condensed milk granules) and pure cashew and kesar (saffron) in different shapes and flavors and colours. Due to our immense capability in this work domain, we have brought forth a huge variety of Kaju Sweet. Relying on our expertise in this domain, we are engaged in offering Kaju Anjeer Roll to our respected clients. Kaju Barfi Sweets are also known as Kaju Katli Sweets which means cashew slices. It is made by using milk, while the nuts, sugar and condensed milk along with khoya kheer are used for thickening.